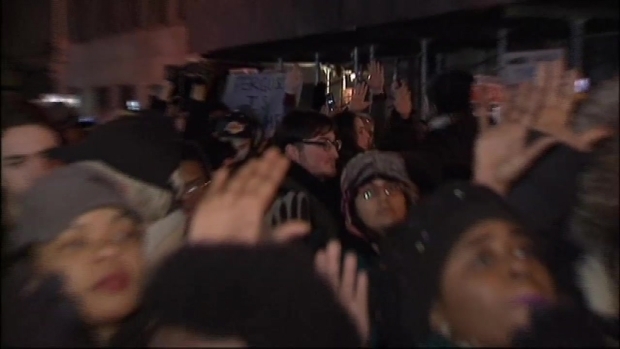 Video Shows NYC Protesters Chanting for "Dead Cops"
Video captured from Saturday's protests in New York City appeared to show demonstrators apparently calling for the deaths of police officers, hours before violence on the Brooklyn Bridge marred the massive march in protest of police killings of black men, including Eric Garner on Staten Island. The video, posted on YouTube, shows a few dozen protesters marching down Fifth Avenue at 32nd Street Saturday afternoon. After a few seconds of chanting "Hands up, don’t shoot," the demonstrators changed their cry, apparently yelling out in unison "What do we want? Dead cops. When do we want it? Now." The protesters repeated the chant for nearly a minute before again changing their cry. The video was captured at about 4:30 p.m., a few hours before two police officers were hurt by a man who tried to throw a garbage can from the Brooklyn Bridge's pedestrian walkway onto the officers below. Thousands of people marched in Manhattan Saturday to protest the killing of unarmed black men by police officers - a demonstration marred by sporadic clashes with police. Marc Santia reports. Police later arrested Baruch College adjunct professor Eric Linsker in the assault. Police said that Linsker allegedly had recently purchased hammers and a black face mask in his bag. Linsker was charged with second-degree assault, resisting arrest, first-degree rioting, unlawful possession of marijuana and three counts of criminal possession of a weapon. He was released without bail after an arraignment Sunday. In a separate confrontation on the bridge, a person was arrested for disorderly conduct after an NYPD traffic agent's car was smashed. The arrests marred the massive, otherwise peaceful march, which police said included at least 25,000 demonstrators. Protesters carried signs reading "Jail Killer Cops" and "Black Lives Matter." They chanted "I can't breathe," the last words of Garner, who died after he was placed in a police chokehold while being arrested on Staten Island.